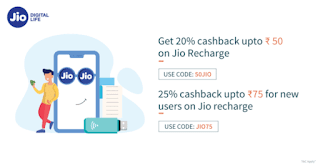 Freecharge Jio Offers – Get upto Rs 75 Cashback on JIO Recharge. The offer is valid once per User/FreeCharge Account/credit card/debit card/net banking/device/mobile number till 28th February 2019. 3. Login/Signup on Freecharge App. 4. Initiate your Jio Recharge of any amount. 6. Once the Coupon code get applied successfully, Complete the transaction. 7. You will get the Cashback in your Freecharge wallet. To avail this offer, the customer needs to undertake a successful transaction on the FreeCharge website, Mobile website or FreeCharge App and enter the JIO50 code while performing the transaction. The customer shall receive 20% upto Rs.50 as cashback in the form of FreeCharge Gift Instrument within 72 hours from the date of the transaction, the same can be redeemed within 1095 days from the date of the credit and is non-transferable. FreeCharge reserves the right to disqualify any FreeCharge Account from the benefits of this offer in case of any fraudulent activity/suspicious transactions. Freecharge reserves the right to modify/change all or any of the terms applicable to this offer or discontinue this offer without assigning any reasons or without any prior intimation or discontinue this offer without assigning any reasons or without any prior intimation whatsoever. In case of any disputes, FreeCharge decision shall be final. To avail this offer, the customer needs to undertake a successful transaction on the FreeCharge website, Mobile website or FreeCharge App and enter the JIO75 code while performing the transaction.Valid only for Jio new users. The customer shall receive flat Rs.75 as cashback in the form of FreeCharge Gift Instrument within 72 hours from the date of the transaction, the same can be redeemed within 1095 days from the date of the credit and is non-transferable.